American, Asian, African, Pacific artworks; numismatics; exhibits of contemporary art. From a Colonial-era portrait by John Singleton Copley to a Pop-era Campbell’s Tomato Juice box by Andy Warhol, The Newark Museum has one of the world’s most distinguished collections of American art. Beginning on May 10, 2001, the Museum will present an entirely new experience of these works—more than 300 in all, installed and interpreted in 32,000 square feet of gallery space—under the title of Picturing America. Presented in galleries originally designed by architect Michael Graves, which have received new lighting and bold colors based on historical sources, the masterworks in Picturing America come to life through an installation that connects the artists’ visual motifs and strategies to broader issues in America’s history and culture. Since its founding in 1909, The Newark Museum has been in the forefront of collecting American art. It was among the first to acquire works by contemporary American artists (who at the time included John Sloan, Robert Henri, George Bellows, Max Weber, Henry Ossawa Tanner and John Marin) and was similarly far-sighted in presenting works by African American artists, photographers and folk artists. Some 250 years’ worth of paintings and sculptures join in eye-opening combinations with objects in other media to tell the story of Picturing America. In the gallery devoted to "Romantic Portraits for the Eastern Cities," paintings by Gilbert Stuart, Thomas Sully and Rembrandt Peale appear next to superb examples of Federal-style furniture—the sort of property that was owned by the portrait-sitters and carefully depicted with them. In the gallery on artists in the West, the spiritualized landscapes of Albert Bierstadt and Thomas Moran mingle with Native American works that offer a contrasting vision of God’s presence in nature. In "The City and Modernism," paintings by Charles Sheeler and Joseph Stella, reflecting the excitement of new technology and the experience of the industrial city, are shown with photographs on the same subjects by Berenice Abbott and Edward Steichen and a cocktail table of gleaming metal by Donald Deskey. Picturing America is made possible in part through the support of The Henry Luce Foundation, National Endowment for the Humanities, Institute of Museum and Library Services, Geraldine R. Dodge Foundation, New Jersey State Council on the Arts and National Endowment for the Arts. This reinstallation of our internationally known collection of ancient glass completes the innovative reinstallation of ancient art begun with the galleries of ancient Egyptian and Greek art. The collection of New Jersey resident and chemist Eugene Schaefer, amassed in the teens and twenties of this century, comprises ancient glass from 1500 B.C. 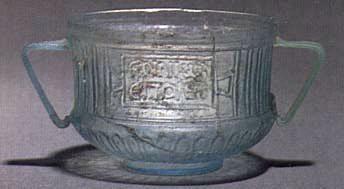 Egypt through Greece, Rome and the Islamic cultures to 1200 A.D.
glassmakers such as Louis Tiffany. Video clips will show master glassmaker Bill Gudenrath demonstrating ancient techniques for working the challenging medium of glass. Original letters and photographs on Eugene Schaefer and his collection will also be featured. The beauty of ancient glass has captivated a small but dedicated group of collectors in the New York and New Jersey region. A selection of their treasures will be highlighted in this exhibit. In addition to our local audience, this showing is being mounted in honor of the October visit of the Congress of the International Association for the History of Glass, a group of glass enthusiasts and scholars from many countries. Dynamic Earth: Revealing Nature’s Secrets! Scheduled to open in Spring 2002 is an innovative, ongoing Science exhibition — Dynamic Earth: Revealing Nature’s Secrets! — which will showcase the institution’s natural history collection. The Victoria Hall of Science will combine the already existing mini zoo, Alice and Leonard Dreyfuss Planetarium, Spharæ™ (a traveling planetarium) and Margaret Chubb Parsons Studios and Science Learning Laboratory to form a comprehensive natural science education resource unique in the region. Dynamic Earth: Revealing Nature’s Secrets! will consist of interrelated areas, each with a specific theme, including, The Dynamic Earth: Forces of Change, Life Adapts to Change, Diversity in Your Backyard: New Jersey Highlands, A Cave of Secrets, and the Discovery Field Station. Ghanaian society and ritual culture. Its beauty appeals to many, and today kente is prominent in contemporary African American society as well, often embraced as a symbol of black identity. The exhibition has two overlying themes: the roots of kente in Asante and Ewe culture in Ghana and its spread to other parts of Africa; and the role of kente as it has been adopted— and Adapted— in the Unites States, beginning with the Black Nationalists and pan-African movements and continuing to the present. Wrapped in Pride brings together some 185 examples of traditional and modern kente, including masterpieces from the permanent collections of The Newark Museum; the UCLA Fowler Museum of Cultural History; the Smithsonain Institution; and leading private collections. A range of patterns are displayed and examined, with examples of kente cloth supplemented by a rich selection of field, historical and documentary photographs. Wrapped in Pride: Ghanaian Kente and African American Identity is accompanied by q 248-page illustrated catalogue, produced by the UCLA Fowler Museum of Cultural History. The publication represents the first comprehensive volume on the subject, and features essays by a number of leading scholars addressing the development and meaning of kente and issues of dress and identity, as well as numerous color images of work in the exhibition. Organizing Institutions: Wrapped in Pride: Ghanaian Kente and African American Identity was organized by the UCLA Fowler Museum of Cultural History and The Newark Museum. Curators: The exhibition is co-curated by Doran H. Ross, Director of the UCLA Fowler Museum of Cultural History, and Anne Spencer, Curator of Africa, the American and the Pacific at The Newark Museum, recently retired. Funding: The exhibition in its national tour are made possible by Ford Motor Company. The exhibition has received funding from the National Endowment for the Humanities, dedicated to expanding American understanding of history and culture; the National Endowment for the Arts; and the Getty Grant Program for the publication. Additional support has been received from foundations, corporations and individuals. The Newark Museum’s presentation of Wrapped in Pride: Ghanaian Kente and African American Identity also received funding from the Geraldine R. Dodge Foundation; The Jerome L. Joss Foundation; the Victoria Foundation, Inc., The Prudential Foundation; AT&T; the New Jersey Council for the Humanities; the New Jersey State Council on the Arts/Department of State; and The Chase Manhattan Bank. Additional support was provided by Ghana Airways Limited and New Jersey Network Television. the sciences (Natural Science Collection; the Alice and Leonard Dreyfuss Planetarium; and the Mini Zoo, with live animals representing major habitats of the world). Objects from the Classical Collection illustrate contrasting lifestyles and world views of two of the ancient world’s greatest cultures. Artifacts and antiquities are arranged to highlight family life; religious ideas and ceremonies; and self-presentation in art. Exciting visual displays and technologies combine to present old favorites in new ways, such as the Egyptian mummy coffin of Henet-Mer and the Greek Herakles and the Lion amphora. The Museum’s renowned Tibetan Collection encompasses the breadth of religious and lay culture in Tibet from the thirteenth through mid-twentieth centuries, with the magnificent centerpiece the Tibetan Buddhist Altar (see below). Reinstalled for the exhibition, From the Sacred Realm: Treasures of Tibetan Art in the Collection of The Newark Museum (October 15, 1999–January 23, 2000), the Tibetan Galleries now include an authentically painted entrance foyer adjacent to the Altar, which creates a visual "passage" to the entire suite of galleries. The construction, decoration and consecration of the Museum’s Tibetan Buddhist Altar, a three-year project taking place from 1988–90, represents a collaborative effort between the Museum and the local Tibetan community. A permanent installation, the Altar provides an authentic and sacred space in which to display objects that are part of a living religious tradition. His Holiness, the XIV Dalai Lama performed a consecration ceremony for the Altar in 1990. The structure of the Altar was designed by the Museum’s exhibition staff in consultation with Michael Graves, architect for the renovation, and Tibetan advisors. Artist-in-residence Phuntsok Dorje, a Tibetan artist trained at Rumtek Monastery in Sikkim, completed one-and-a-half years of work painting the ceiling, columns, walls, bookshelves and shrine opening in traditional Tibetan designs. Sacred mantras (prayers), auspicious flowers and animals and rainbow hues all contribute to the beauty and radiance of the Altar. The consecration by His Holiness, the XIV Dalai Lama completed the process of constructing a sacred space. Assisted by ritual masters, lamas and attendants, His Holiness the Dalai Lama first made three prostrations and presented a white kata, a silk scarf, which is the traditional Tibetan greeting symbolizing purity. Next, prayers were chanted, with grain tossed between chants to make the prayers "true" and "solid." The potent emblems of tantric Buddhism, the dorje and bell (power and wisdom) were held in special positions. The central moment of the ceremony was an invocation to the Buddhas to enter the Altar and to stay there. These prayers were repeated three times, reminding the Buddhas that they have promised to stay in this world to teach enlightenment to all and not to enter final Nirvana until this task is completed. The assembled images, tankas, documents and ritual objects radiate a spiritual presence. The prayers and rites performed at the consecration ceremony empowered the space that enshrines the icons and objects. The Museum is greatly honored to have had His Holiness the XIV Dalai Lama, spiritual leader of the Tibetan people and 1989 Nobel Peace Laureate, lend His own luminous presence to its Altar. In 1999, Tibetan artist Phuntsok Dorje returned to the Museum to paint an ornate ceremonial entry room to the Altar. Funding: The Tibetan Buddhist Altar was created as part of a special project, Tibet, The Living Tradition, 1988–91. Major funding for the project was generously provided by the National Endowment for the Arts, the National Endowment for the Humanities, The Getty Grant Program, the Geraldine R. Dodge Foundation and proceeds from A Night in Old Llasa benefit. The Decorative Arts Galleries encompass two floors of the 1885 Ballantine House, a restored National Historic Landmark that comprises part of the Museum complex. The House & Home installation places objects from the acclaimed Decorative Arts Collection in context to explore Victorian home life and its relationship to our lives today. 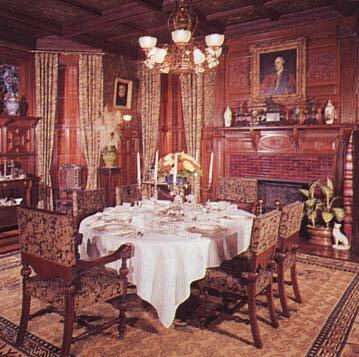 Funding: The 1994 Ballantine House restoration and the House & Home installation were funded in part by the Lila Wallace-Reader’s Digest Fund Museum Collections Accessibility Initiative. Location: The Museum is located at 49 Washington Street in the Downtown/Arts District of Newark, New Jersey, and is easily accessible by public transportation as well as from all area major highways. Public Hours: Wednesdays through Sundays, 12:00 noon to 5:00 p.m., with evening hours on Thursdays until 8:30 p.m. The Museum Café, located in the Engelhard Court, is open for light gourmet fare Wednesdays through Sundays, 12:00 noon to 3:30 p.m., with special extended hours on Thursdays from 5:30 to 8:30 p.m. The Museum is closed Mondays, Tuesdays and major holidays. Admission: Admission to the Museum is free to all visitors. 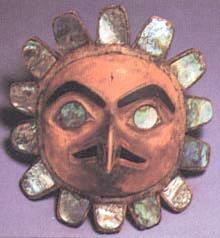 WEBSITE: Visit 24 hours a day, seven days a week, online at www.newarkmuseum.org. Funding: The Newark Museum, a not-for-profit museum of art, science and education, receives operating support from the City of Newark, the State of New Jersey, the New Jersey State Council on the Arts/Department of State and corporate, foundation and individual donations. Funds for acquisitions and activities other than operations are provided by Members of the Museum and other contributors. Information: For general information or directions, the public may call 973-596-6550, 800-7MUSEUM (toll-free) or 973-596-6355 (TTY for the hearing-impaired); or consult the Museum’s website www.newarkmuseum.org. 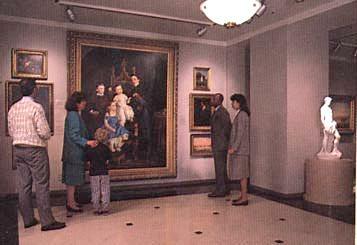 Recorded information on exhibitions is available 24 hours per day at 973-596-6697, or on public programs at 973-596-6658. For group tour reservations, call 973-596-6615. Extended Thursday Hours 12:00-8:30 p.m.